Do you realize that census records are the most readily available genealogical source document? They are one of the most useful genealogy tools yet they are often the most misunderstood. Census records are actually a goldmine of data. This book will explain how to make the most of these records. In this work I explain what the census records are, what information they contain, and how to use them. I outline each year of the Federal Census (1790-1930) and explain them in detail. 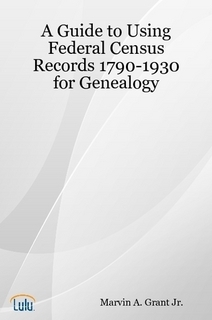 This book is designed to help the census novices and intermediate researchers come to grips with this valuable genealogical tool. Experts may also find this book useful. Detailed explanation of each census 1790-1930 with examples. Detailed explanation for every column of data on each census, including Mortality and Slave schedules. Charts to help calculate the approximate birth dates of persons listed on each census. Edition: Fourth (15 Jul 2004), originally published 2003. If you wish to pay by check or money order you must order it from me via snail-mail. Send $19.00 to me at: Marty Grant, 3291 Alton Phillips Road, Kinston, NC 28504. The price for snail-mail orders includes shipping and handling. Once your check has cleared I will order the book for you and have it shipped to your address.